Update: The update has been released, get the iOS 4.2 download now. Late last week we heard that the public release of iOS 4.2 was waiting on enough third party applications to be accepted into the App Store, this was to insure that users have immediate access to apps that take advantage of new features in iOS 4.2. 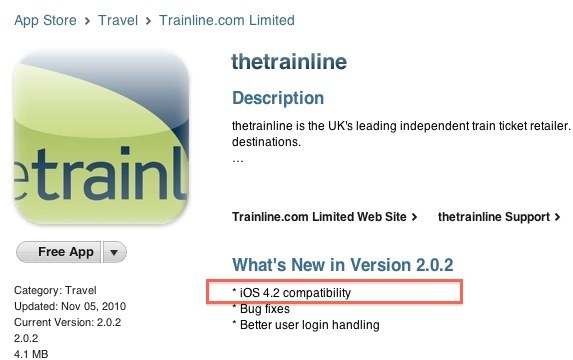 Since then, several apps have appeared on the iTunes App Store labeled as ‘iOS 4.2 compatibility’ or “iOS 4.2 ready”, further signifying that the iOS 4.2 release date is any day now. This would fit in line with the November 2010 timeframe that Apple set earlier in the year. The iOS 4.2 update is hotly anticipated for a variety of new features, from AirPlay to printing, but perhaps most excited for the release are iPad owners, who will gain multitasking and folder support when iOS 4 comes to the device. While the rest of the public waits for a release, developers can get your hands on the iOS 4.2 GM build now. The 4.2 update is said to require iTunes 10.1 to install, and will work with the iPhone, iPad, and iPod touch. With the release of iOS 4.2 imminent, some have shown surprise that the iOS 4.2 update did not arrive on time to prevent the iPhone Daylight Savings Time bug, which has gained a fair amount of attention over the last few weeks as iOS users alarm clocks go off an hour later than intended. iOS 4.2 is said to provide a permanent fix for that bug. On the Apple support page regarding the issue with recurring alarms http://support.apple.com/kb/TS3542 it says that recurring alarms can be set again on the 7th this could suggest a change. I presume you meant iTunes 10.0.1. Correct? Not likely, since it’s 10.0.1.22 right now! So… 10.1.x.x would makes sense. Definitely looking forward to it for the iPad, I’ve gotten used to the multi-tasking stuff on the iPhone and now the iPad seems awkward at times. But I’m REALLY looking forward to AirPlay for sending music, photos and video straight from the iPhone to Apple TV. Given the number of things that have to happen to play a video taken on the phone on the atv I’m looking forward to the simplicity. I do have 10.1-hope 4 comes out soon. Wish it was included with the ipad.